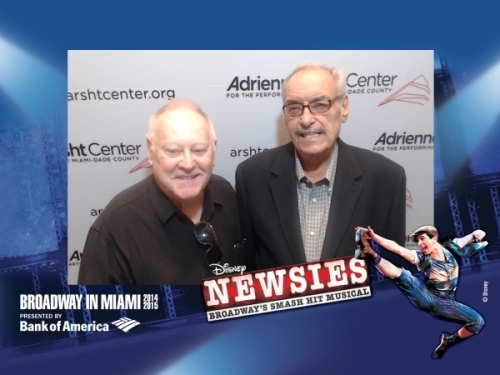 (Allen and I at "Disney Newsies" last night) I have no right to tell people how to live their lives and I’m not but I am trying to understand how they do it! Actually I am, at 79, still trying to understand people! I go to a few blogs and I just shake my head. They are so rigid that I just know they schedule what time to urinate! And then there are the ones with goals. Now I know it is great having goals but I have gotten through 79 years of not having goals and I am a very happy, old, retired, contented man who has most everything he needs. Okay I don’t have a car because I can’t afford the insurance but with my 20th Leap Year birthday coming up I just might suggest someone, as a gift, surprise me with a year’s life insurance for a car I would buy! Is that a goal? I don’t think so because it isn’t something I feel I need to ‘accomplish’. Most of my life I have been impulsive/compulsive and now that I am retired the one thing I won’t do is schedule every hour of my day. Sure I have doctor’s appointments and I go to the theatre so there is some scheduling there but the one thing I have learned is “So what?” So what if I don’t clean the apartment every day? So what if I don’t take a shower every day? So what if I don’t keep a doctor’s appointment? So what if I don’t go to a wedding or if I don’t post a blog a day? So what if I don’t see a movie every Friday? I wasn’t very goal oriented most of my life. Yes I wanted to graduate high school and yes I wanted to earn a living but I never said by the age of whatever I have had to accomplish this or that. As a server I wanted to be a professional server but it wasn’t a goal to be the best ever (though I probably was!) and even when it came to losing over a 100+ pounds I didn’t make goals, I knew if I did the right thing it would come off. I may have had a goal to be one of the very few, one of the only 2-3%, to keep it off but I wasn’t rigid about what I did. Yes I put back 28 pounds, so what? It is the rigid routines that people have that drive me crazy! “I have to do this at such and such a time and that an hour and 23 minutes later and then 2 hours and 12 minutes I must do this.” The world will not fall apart if it isn’t done and that might bruise an ego but what if they dropped dead right now--not that I wish that on them--so what? I don’t know if goal setting and/or if being so rigid is taught by their parents or they saw their parents living in chaos and they didn’t want that so they schedule everything. Did parents teach others to set goals or they would go nowhere in the world? To see people have goals and/or very rigid schedules for things that can be done at anytime even when they are retired says to me they don’t know how to relax! Is it on the 40 year olds schedule to sit and appreciate Mother Nature at exactly 3:05 PM? Will the 50 year old set a goal to live to be a 60 year old? How will they ever enjoy retirement? Yes I have a goal of wanting to go back to New Zealand when (not if) I win the lottery but I have no plans for when and should I win the lotto on Saturday I will collect the money on Monday and go to the airport and get on a plane to Auckland! Will I change? Probably as much as the one who has goals and/or rigid schedules will change---not at all!